The only thing I am sorry for is that too many have died instead of healing. As for hurting the feelings of all these awareness talkers, I have no sympathy left for them. None! What did they think would be accomplished by talking about the anguish that belongs to someone else? Did it give them a voice to ask for help before they did it? Did it help soothe their heartache? Did it offer them any hope that tomorrow would be any better than their last day was? Letting the suffering know there are many more opting for suicide supports their own contemplation of resolving their agony. How about we change the conversation and talk about not just reasons to live but how to heal? Time to stop what failed and change the conversation. Suicide Awareness did no good at all for those who suffer. It did a great deal for the spreaders of it in terms of publicity for profit but evidence has shown nothing positive came out of it. What does work is when a veteran talks to other veterans and offers hope they can defeat PTSD just like they did and then tell the others how they did it. What works is when veterans find the support they long for to replace the loneliness they exist with every day. What works is when veterans show up just because they know one of their own is hurting. What really works best is pointing out the simple fact that when a nation has veterans taking their own lives after surviving combat in higher numbers after everyone has been doing a hell of a lot of talking, it is time to changed the message! 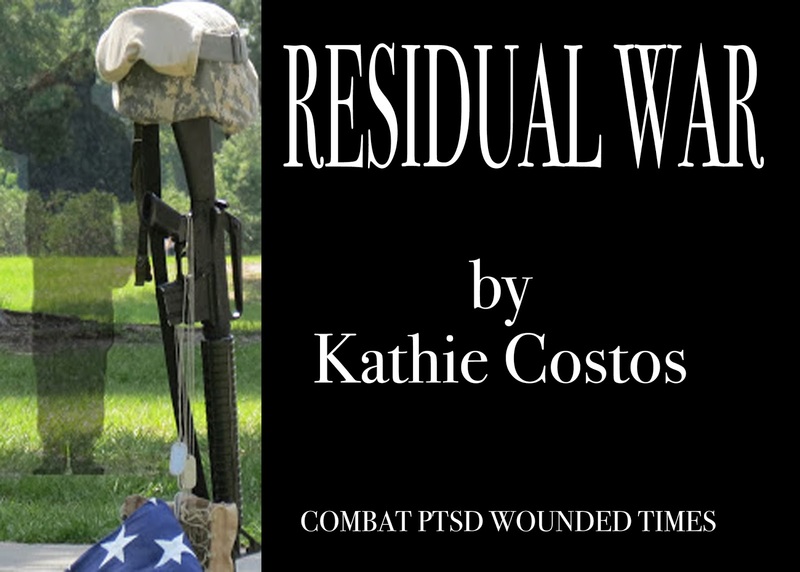 Residual War (fiction mystery) is about the battles fought inside and the private hell Amanda lived with for 6 years. She did what she was compelled to do. No time to think about the consequences, she took quick action to save lives. Lives she blamed for shattering too many others including herself. All she could see was what bad came out of all of it. Forced to transfer to a Fort where she couldn't get into any more trouble before she was eligible for full retirement, Amanda descended into a deeper hell all tied to that one day in Afghanistan. After three days she resurrected hope for forty others and was shown that for all the misery she thought she spread, there were many miracles unfolding at the same time but she was just too busy grieving to see any of them. Heroic actions by those who do not see themselves as heroes because living without taking action would be worse than dying doing it. They did not want sympathy. They wanted to heal enough to live with their memories. Killing those memories would have been like their friends dying all over again. Veterans left homeless at the mercy of vultures because the military decided they had entered into service with a pre-existing mental illness and booted them out with "personality disorders" instead of help. Leaving them with nothing, they became lab rats no one cared about. That is until Amanda refused to let it happen. Judgement is part of all of this because humans tend to judge what they see instead of looking deeper, at least long enough to understand how someone would devolve into a complete total mess. Peer support is part of all this because when no one understands what it is like to be them they feel like outcasts. But they were not unclean. They were remarkable humans doing whatever they could, whatever they were compelled to do in order to save the lives of others. They suffered for it, were blamed for what they did out of suffering and no one noticed it was all tied to the simple fact they faced it all with no thought for themselves. Ya, I know. That's the part everyone keeps leaving out of all this "awareness" talk. How do they think they anyone can reach a veteran playing on their own needs without letting them know they will be helping others after they heal? Each one of us has touched the lives of others. Either we helped them, encouraged them or we destroyed them. Does talking about veterans committing suicide help them or harm them? It surely does not help them by giving any hope to heal. It does not encourage them to see why they are suffering any more than it comforts them by the fact they are not destined to remain suffering as they are. When do we tell them they can heal if we take up so much time pushing the rumor of a number? Today is September 11, the day that started many wars but finished none. Soon after 9-11 I was talking with others involved with PTSD and we saw what was coming after this nation was attacked. That is because we were paying attention to the generations of veterans we already had with us for decades. 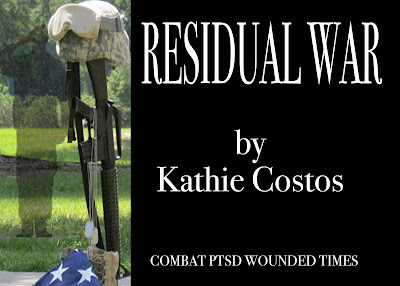 RESIDUAL WAR is about the younger generation learning from the older generation that this is a war that does not end but does not have to defeat your life. "Hell was something Amanda was not afraid of. She had lived there for years." Almost forgot. Amanda is a military chaplain.